Sheet pan dinners are all the rage but they have been around for generations of home cooks feeding their families. Anything can be combined on a sheet pan for a one-pan dinner as long as most ingredients will cook in about the same time. Chopping ingredients in similar sizes is important for even cooking and providing some fats for nice roasting is key to success. I have been frustrated to see fussy sheet pan recipes popping up that require ingredients to be cooked on 2 pans at different temperatures or time settings. Sort of defies the whole purpose in my eyes! In this combination I started by creating a bed of fresh thyme on a lined sheet pan then placed 9 chicken thighs on top. I love thyme with chicken but fresh thyme always tends to burn so I put in under the chicken to get the flavor and avoid the burn. I seasoned the boneless, skinned thighs with a commercial blend of poultry spices(Weber’s Beer Can Chicken Blend). Your favorite will do. 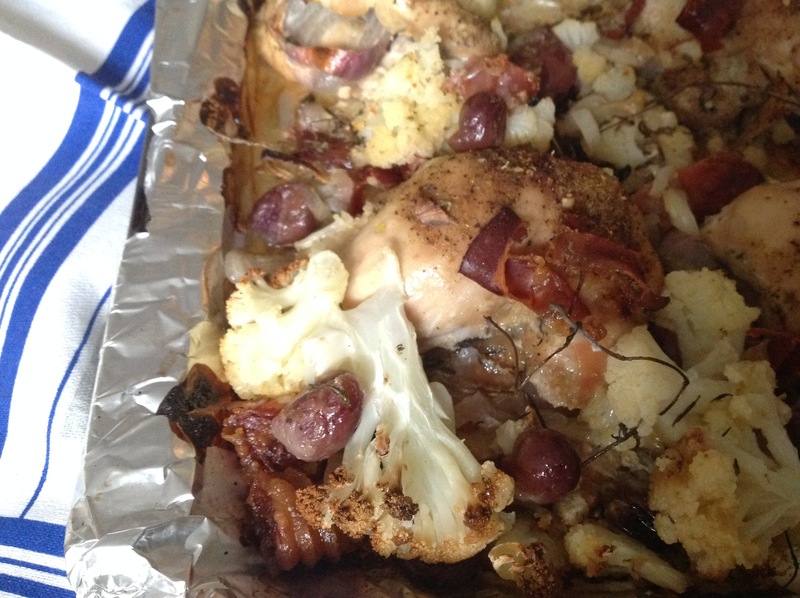 I scattered a whole cauliflower divided into chunky florets, around the chicken. We have been substituting this power food as a starch in much of our winter cooking. 3 shallots were sliced and distributed over the top of the whole dish. I tucked some of the shallots under each chicken thigh as well. I then studded the dish with about 3 dozen red seedless whole grapes and 3 ounces of prosciutto, chopped(you could substitute pancetta or chopped bacon). Bake at 425F for 40 minutes. Finish the dish with a drizzle of balsamic vinegar for a shot of brightness. Roasting grapes caramelizes their sugars so they impart a burst of sweetness and are absolutely divine in contrast with the salty prosciutto. Make sure to scrape all the tasty bits on the bottom of the pan. Fast, easy and with oh soooo good sweet and savory notes and a super quick clean up. My kind of weeknight cooking! 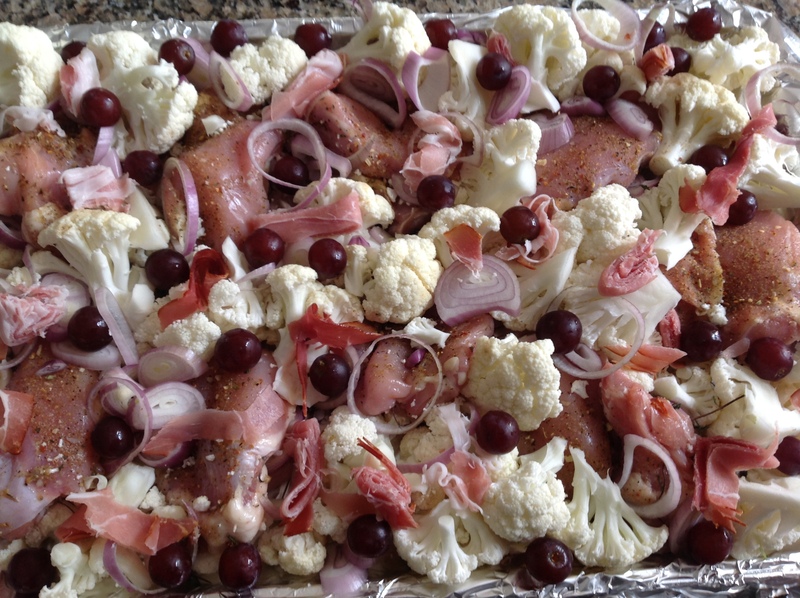 This entry was posted in Recipes and tagged Chicken thighs with cauliflower and shallots, chicken thighs with cauliflower shallots grapes and prosciutto, sheet pan chicken thigh dinner with cauliflower and shallots by Johanne Lamarche. Bookmark the permalink. This is my kind of dinner, Loretta. I LOVE every ingredient. Great tip to put the thyme underneath the chicken too. Thanks Josette! Those grapes were incredible and I don’t know why I never thought of adding them to savory dishes before. These were passed their prime so they inspired me to get creative and I am glad I did! I’ll have to remember this one when I have past-their-prime grapes too!! (which happens often because we buy a HUGE container at Costco…) Perfect! Love this one, Johanne. 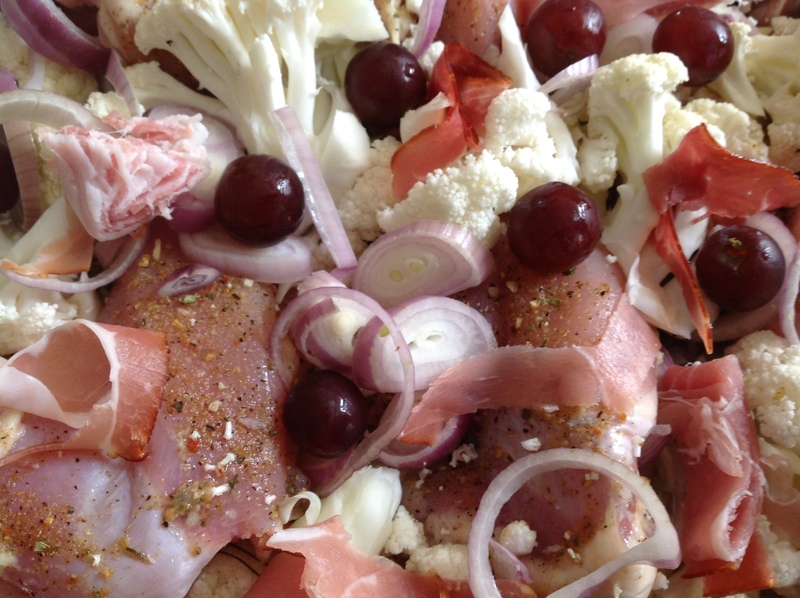 Any suggestions for less carb-laden alternatives to grapes (for my hubby…) ??? Cherry tomatoes or another vegetable like zucchini, cut in at least 1″ chunks so it does not cook too fast. I think if tomatoes work diet-wise for Rich, that would give you the most similar texture to the grapes and they would go well with the prosciutto too. I hope you like the dish Caroline! It was and so quick to throw together! Glad you like it too. Oh those grapes Jenna!!! A very tasty discovery that I hope you’ll try too! First time I tried the Weber mix which my hubby had snuck into the spice cupboard. Readily available I think in supermarket spice aisles. The key to this is having the ingredients dry so nothing goes soggy during the roasting. Chicken is likely to weep a bit over 2 days. If she could assemble the dish you could have everything ready to go. Another idea is to cook it, cool it and put it in a container to be reheated. Not as good but we enjoyed leftovers of this reheated. Hope this helps. I just made a shepards pie with mashed cauliflower instead of potatoes and with lean pork or turkey instead of beef. That could be assembled and baked on site. I have to admit it was one of those thrown together dishes that really turned out great! Thank you! My mouth is salivating just looking at this dish. Chicken thighs have the best flavor don’t they? It would never have occurred to me to pair them with grapes and proscuitto but what a wonderful melding of flavors. Yum. I hope you’ll try this dish Teresa! A delicious happenstance creation from what was in the fridge!